Yep, it’s another Toronto vegetarian food update. 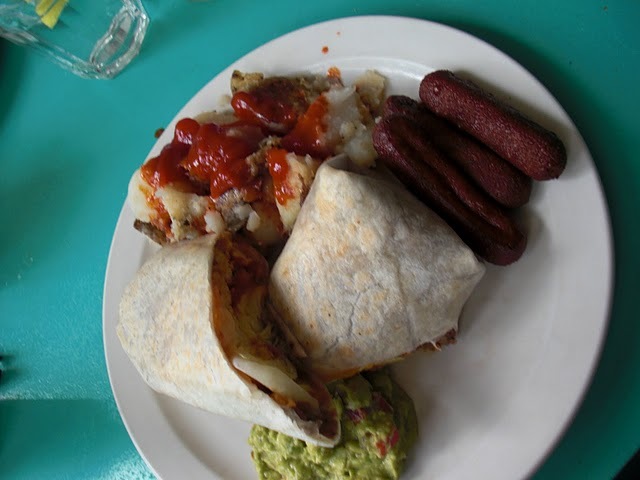 Multicultural, artsy, and very urban, Toronto not only has plenty of vegetarian-friendly restaurants and cuisines, but some great local favorites dedicated to your vegetarian and vegan whims. One of my favorites is Sadies’ Diner and Juice Bar. I stopped by with my Canada man for some weekend brunch and was treated with a lush all-day breakfast menu and a blessedly short wait. 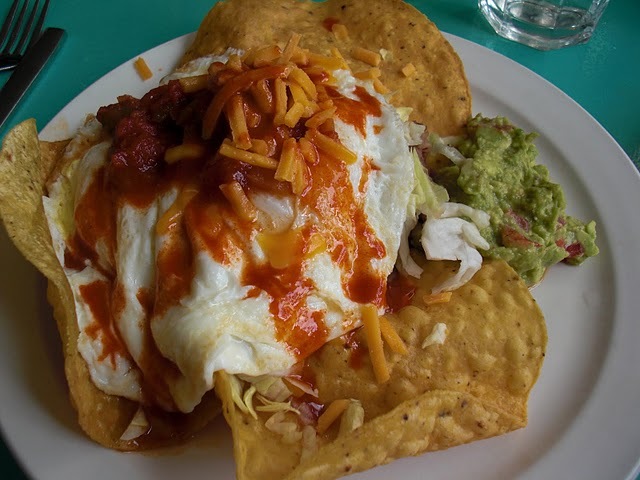 I’m a sucker for spicy eggs in the morning, and after much oggling of the menu I finally decided on the huevos rancheros with crispy tortillas, refried beans, guac and cheddar (also available with tofu scramble and vegan cheese). Certainly not health food, but it hit the spot. The man ordered the breakfast burrito which featured a filling almost identical to my huevos. But he got the most delicious vegan sausage on the side. What’s the secret to making these run-of-the-mill Yves grocery sausages delicious? Oil. The deep fat fried kind. They were delicious. Unfortunately, Michael Cera didn’t sit down at the table beside us (though the vegetarian and native Torontonian recently did pay a visit), but the food at Sadie’s more than made up for it.